Marionville, Missouri: There are good mistakes, bad mistakes, and then there are the kind of mistakes that cause you to end up with a gun in your mouth. Jon Lewis Alexander, 54, is no ordinary store clerk. He has worked several “high risk” jobs and served four tours of duty in Iraq during his 30 years in the U.S. military. Video surveillance from Saturday night captures the moment a would-be thief entered the Marionville, Mo., store where Alexander works. 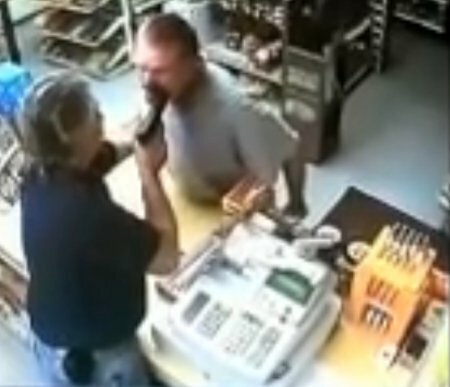 The thief hesitates for a moment and pulls a gun – but not fast enough to dissuade Alexander from pulling his own Walther PPX 9 mm handgun and sticking it in the hapless thief’s mouth. No one was hurt and no shots were fired. It’s at times like these that law abiding citizens should be thanking the Founding Fathers for being wise enough to put the 2nd Amendment in place and thieves like the one in this video who hasn’t yet been apprehended, should be thanking God that he doesn’t have an extra hole in the back of his head.